Tooth loss is a problem faced by over 120 million Americans every day. If you’re one of them, then you know all too well the issues they can create. They may lower your confidence or cause speaking to become more difficult. Patients may find that their diet is reduced or their bite collapses altogether and creates a "hunched" facial appearance. Fortunately, dentistry has stepped up to face this issue with dental implants, the most natural-looking and longest lasting tooth replacement available today. With them, Dr. Bruno can restore any number of missing teeth and give you a strong smile that will last a lifetime. Are dental implants right for you? Contact us today to learn more. 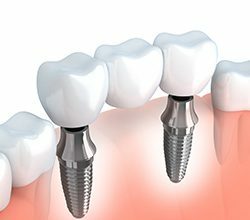 A dental implant is actually a small titanium screw that is placed directly into the jaw in order to mimic the root structure of a lost tooth. To make sure your implants are placed safely and securely, Dr. Bruno will refer you to one of her hand selected specialists. Most patients report feeling very little to no pain either during or after the procedure. Once it is completed, you’ll be given 3-6 months to heal before you return to Bruno Integrative Dentistry to receive your new teeth. 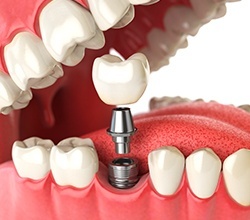 An implant-retained crown can be used to replace a single tooth. It consists of three main components: a porcelain crown, an abutment and the implant post itself. The custom-made crown will be specially shaded to match your surrounding teeth and the abutment will attach it firmly to the post to create a strong base. For a row of 2-3 missing teeth, two implant crowns can be placed on either side of the gap and attached to prosthetic teeth to close the space, creating an implant-retained bridge. If you’re tired of uncomfortable dentures you can’t trust to stay in place, dental implants may be exactly what you need. We can use them to secure a fixed denture that will do a much better job of staying put than your typical removable denture. 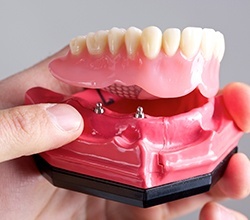 The implants help the dentures maintain their fit for longer and also greatly reduces the discomfort and sore spots that arise from traditional dentures putting pressure on the gum tissue and bone. The increased retention of the implant supported denture affords the patient to have a more varied diet and to enjoy life as if they had their own natural teeth!